Any precious metal is going to show scratches, regardless of whether it is palladium, platinum or gold. None of these metals is scratch resistant. The outliers for finish retention are sterling (serious scratching or denting) and stainless steel (minimal scratching or denting). The precious metals, including all the golds, platinum and palladium are going to scratch in a very similar fashion. In order, from our experience with thousands of rings, 18k yellow scratches the most and 14k nickel white (which we do not prefer to use) scratches the least, with palladium and platinum in between. W hat Does Normal Wear on Precious Metals Look Like? The high luster on a newly polished ring is created by a super soft buffing wheel at high speeds. This initial mirror surface will quickly show scuffing. Even a finger nail and paper can scratch or marr the mirror finish. Normal wear on a high polish surface will include superficial scuff marks that can be made by hard leather, wood and plastic (such as purses, briefcases, dishes, steering wheels), and small dents made by steel objects (such as door knobs, pots & pans, car doors). Gouges can be caused by barbels, lifting rock or other heavy objects, carrying heavy bags with metal in the handles, rock climbing, opening heavy doors like a walk-in safe, and general moving of heavy objects. Palladium has a great wear resistance. We've made thousands of palladium rings, and have been very satisfied with how the surface of our wears over time, compared with the other metals. We use the finest palladium alloy available on the market and the premier caster of palladium to insure the best purity and hardness possible. We also tumble the rings in steel shot for a day to work harden the surface. It will show wear in a similar fashion to gold and platinum. Both gold and platinum have certain alloys that are harder and softer than palladium, so palladium cannot be simply put in order with "gold" and "platinum". Wear resistance refers to how much or little a particular metal wears down over time, i.e., loses weight. Hardness refers to the resistance to denting. Platinum has the greatest wear resistance, followed closely by palladium. 10k and 14k golds will have the greatest hardness. Any broad, high polish surface will show scratches. 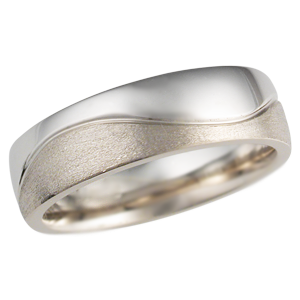 The only way to avoid scratches on your wedding band is to 1) choose a stainless steel wedding ring, 2) have a textured finish. Otherwise, all precious metals and shallow/superficial finishes (matte finish, brushed finish) will eventually take on a similar patina of wear.